Somali pirates seized a tanker carrying more than $20 million of crude oil from Saudi Arabia to the United States in the increasingly dangerous waters off East Africa, an official said Monday, an attack that could pose a huge environmental or security threat. The shipping intelligence company Lloyd's List said the Maran Centaurus is a "very large crude carrier, with a capacity of over 300,000 tons." Stavros Hadzigrigoris from the ship's owners, Maran Tankers Management, said the tanker was carrying around 275,000 metric tons of crude. At an average price of around $75 a barrel, the cargo is worth more than $20 million. Hadzigrigoris declined to say who owned the oil. "You're sitting on a huge ship filled with flammable liquid. You don't want somebody with a gun on top of that," Middleton said. "Financially it's a very costly exercise because the value of oil is so volatile. If it is held for a long time and the price of oil drops, they could lose millions of dollars." Somali pirates are a separate group of criminals from the al Qaeda-affiliated Islamic militants who control large areas of southern Somalia, but anytime pirates hold such valuable and explosive cargo it raises international concerns. Somalia's lawless 1,880-mile coastline provides a perfect haven for pirates to prey on ships heading for the Gulf of Aden, one of the world's busiest shipping routes. The impoverished Horn of Africa nation has not had a functioning government for a generation and the weak U.N.-backed administration is too busy fighting the Islamist insurgency to arrest pirates. Pirates now hold about a dozen vessels hostage and more than 200 crew members. 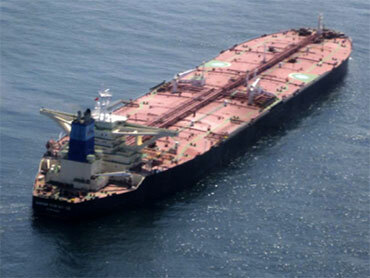 The Maran Centaurus had 28 crew aboard - 16 Filipinos, nine Greeks, two Ukrainians and one Romanian, Harbour said.